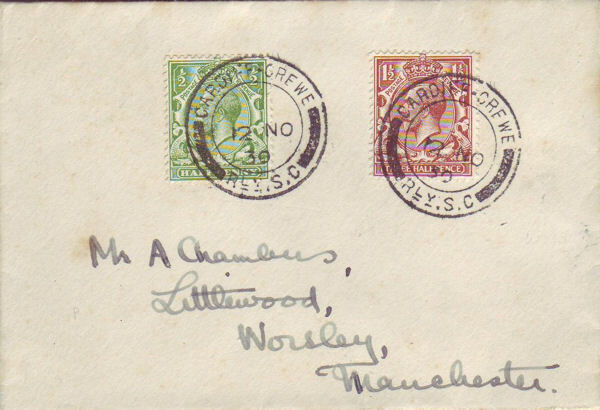 In the years between 1920 and 1939, the TPO network on mainland Great Britain was at its height and most efficient. 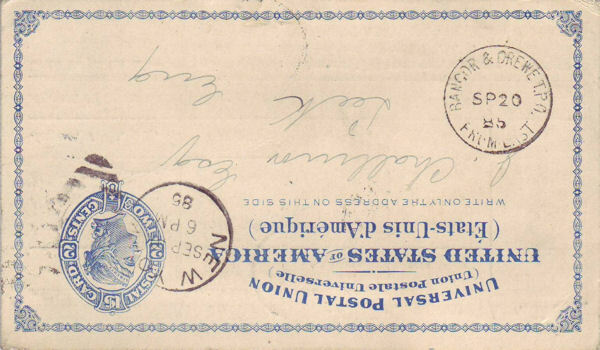 A letter posted in the South of England by 7.00 p.m. could be delivered the next day in the North of Scotland by 12.00 p.m., a feat that could not happen in 2007, even with the benefit of air transport. The following article was published in the Railway Magazine in May 1923, just 5 months after all the railway companies on the British mainland had been grouped into the 'Big Four'. 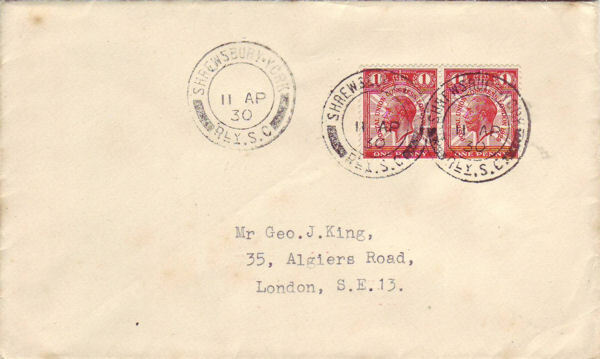 The article was written from a railway observer's view rather than that of postal historians. 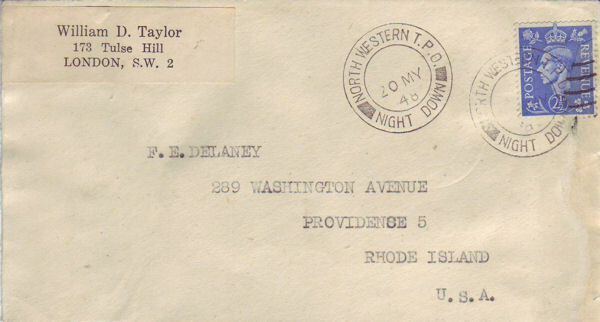 Although the recording of the arrival and departure times of the various trains are accurate, the nomenclature of some of the mail trains may be at odds with the title that they were actually known by. The 'war' mentioned is of course the Great War of 1914-18! The article gives a vivid insight into the connections made between the different trains operated by sometimes different companies, a situation that was being repeated 81 years later when the TPO network was dismantled and all transport of the Mails was placed on the country's overcrowded roads! That pivot of the old London and North Western Railway (L&NWR) system - Crewe - where lines radiate in every direction is, from its geographical position, probably the most important junction in the country, not only from the point of view of passenger traffic, but also mail traffic, for where else can one see so many travelling post office vans and sorting carriages during the night. The busiest period of the 24 hours is from ll.30 p.m. to 2.00 a.m, but the night's work can be said to commence at 11p.m. with the simultaneous arrival of the Inverness, Dundee and Aberdeen down sleeping car train and a semi-fast from Hereford, followed at 11.13 p.m. by the boat train for Stranraer, which has hardly got clear, when at 11.18 p.m., the West of England Mail steams into No 2 platform. This has a miscellaneous collection of through coaches - Exeter to Glasgow, Cardiff to Liverpool, Penzance to Liverpool, Plymouth to Liverpool, Plymouth to Manchester, and a mail van which terminates here (the Cardiff - Crewe Railway Sorting Carriage). Trains now follow in rapid succession: 11.28 p.m. sees an arrival from Swansea on platform 1 with through coaches from Swansea to York, and Shrewsbury to Newcastle, and two L & N W mail vans for York (Shrewsbury - York Railway SC). Then a local train from Manchester runs into platform 6 at 11.29 (Manchester - Crewe SC), and at 11.30 the Bangor Mail (Bangor and Crewe TPO from West) arrives on platform 3. The Birmingham Mail (Birmingham and Crewe SC) follows at 11.33 and a North Stafford Railway train from Stoke at 11.35. The next arrival is the North Western TPO Night Down, the famous 'Down Postal Special' established in 1885; this train has now the fastest timing of any between London and Aberdeen, leaving Euston at 8.30 p.m. and arriving at the Granite City at 7.52 a.m. next morning. Before the war, parcel sorting was carried out on the journey, and the arrival at Aberdeen was 17 minutes earlier, despite the consequent heavier loading. It is interesting here to note that the departure time of the night Scots Mail from London, Euston has been 8.30 p.m. since its inception in 1838. Platform No 2 welcomes this train at 11.44 and during its 15 minutes stay, much exchange of mails is done. With the arrival at 11.58 on Platform 1 of the down Irish Mail (London and Holyhead TPO Night Down) - Platforms 1 and 2 become a veritable sea of mail bags. The Irish Mail leaves at 12.08 a.m. and at the same time the Liverpool coaches, which arrived from the West at 11.18, leave the north end of platform 2; meanwhile at 12.03 a.m. the old Scots Up Limited has arrived on No 6 with a through coach from Aberdeen for Plymouth, and one from Glasgow for Exeter. 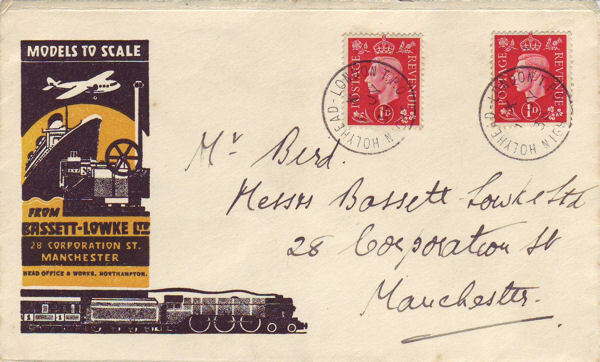 This train in pre-war days conveyed a TPO, but since the withdrawal of parcel sorting on the postal specials there has been ample accommodation for all letter sorting on the Up Special TPO, which reaches Platform 4 at 12.19, and has a stop of 12 min. This train has not such good timing as its down counterpart, leaving Aberdeen as it does at 3.25 p.m., and reaching Euston at 3.55 a.m. Crossing over we find the Shrewsbury - York SC marshalled at the south end of platform 1, ready to leave at 12.30 a.m.. The West of England coaches for Manchester on platform 2 are ready for a 12.40 a.m. departure, and the stock of the Bangor- Crewe TPO which arrived 11.30 p.m. waits to leave platform 3 at 12.45 a.m. for Birmingham - the return journey of the Birmingham and Crewe SC. 12.50 a.m. sees the departure for Glasgow of the sleeping car train from Euston which followed the Shrewsbury-York SC on platform 1, and simultaneously the old Up Limited continues its journey to Euston. A minute later, through coaches for Penzance and Plymouth arrive from Manchester and at 12.53 the Liverpool to London sleeping car train runs into No 4, with through coaches for Cardiff, Penzance and Plymouth. Leaving these behind, it journeys on its way at 1.05 a.m. The next arrival is the supplementary mail for Carlisle - 9.30 from Euston - known as the 10 p.m. North Western Night Mail, because it formally left Euston at 10 p.m.; running into platform 1 at 1.03 a.m., the parcels vans and mail van, together with the Exeter - Glasgow coach which arrived at 11.18 p.m. leave at 1.20 a.m.; the remainder of the train shunting on to platform 2 and departing northwards at 1.40 a.m. for Oxenholme and the Furness district. While these operations have been taking place on platforms 1 and 2, platforms 3 and 4 have again become a scene of activity, for at 1.15 a.m. the York Mails arrive at platform 3 with L & N W TPOs (York - Shrewsbury Railway SC), a NE coach from Newcastle for Shrewsbury, and LNW coaches from York for Swansea. The various through coaches from Aberdeen, Glasgow, Manchester and Liverpool for the West of England have been marshalled together and a Great Western Railway Post Office van added (Crewe - Cardiff Railway SC). The latter leaves at 1.25 a.m., and the former at 1.45 a.m.
Back again to platform 2, we see the Bangor Mail (Bangor and Crewe TPO from East) draw out at 1.50 a.m., and there is a breathing space of five minutes before the Edinburgh, Dundee and Aberdeen Down 'Sleeper' pulls in, stays 10 minutes, and is away again. Traffic now begins to slacken, the bookstall which has been fully lighted up and doing a brisk trade, begins to close down, and the refreshment rooms, which up till now have been 'playing to packed houses', show signs of a trade depression. There is now a 2.15 a.m. train for Liverpool from platform 2, and a 2.40 a.m. for Manchester from platform 7 Bay, carrying parcels principally, while platform 5 is again all excitement with the arrival at 2.35 p.m. of the Up Irish Mail (London and Holyhead TPO Night Up) which causes another stampede to the refreshment rooms; this leaves again at 2.45 a.m., followed by a Birmingham connection at 2.55 a.m. At 2.58 a.m. platform 2 welcomes the 11.40 p.m. from Euston, with its load of sleepers; the front portion goes forward to Glasgow at 3.10 a.m., and the rear portion to Manchester at 3.45 a.m., before which the Glasgow. Inverness and Perth Up 'Sleeper' has arrived on the other side at 3.30 a.m., to leave again at 3.41 a.m., followed by two more Up Scots trains, the Glasgow and Edinburgh at 4.05, and the Aberdeen, Dundee and Stranraer at 4.30, which depart at 4.20 and 4.40 respectively. During the past hour the postal officials of the last two sorting carriages have been busy in the bay platforms with the Crewe to Liverpool SC, which is attached to the Liverpool Down Sleeping Car train arriving on platform 1 at 4.43 a.m. to leave at 5.00 a.m., and the Manchester and Crewe SC which leaves at the same time, as also does a train for Chester. With departure of the 5.05 a.m. for Birmingham, and the 5.30 a.m. for Barrow in Furness, the night can be said to be over, and Crewe can then commence its ordinary day's work, and prepare for another busy night. 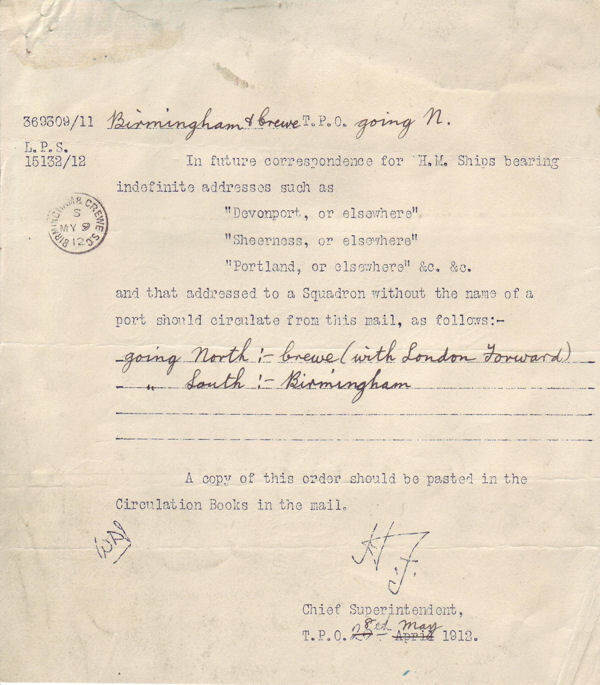 Before leaving the subject of Crewe mails, it may be mentioned that the postal authorities have not reinstated any of the Day Mail Travelling Post Offices serving Crewe, which were withdrawn during the war, these may be summarized as follows. 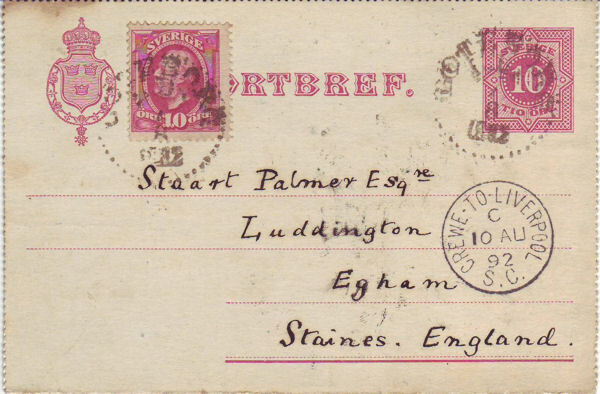 L & N W TPO Mid-day Mail Up: 10.49 a.m. from Crewe (Euston arrive 2.55 p.m.). The only Day Mails now running are the Up and Down London & Holyhead Day TPOs. 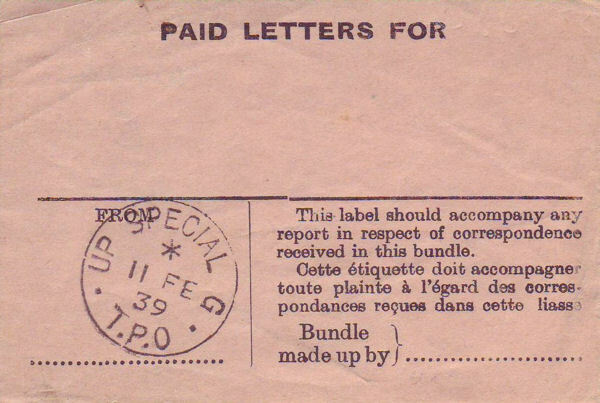 The arrangement and operations of all the above mentioned TPOs remained unchanged until September 1940, by which time all TPO services were suspended for the duration of the war. 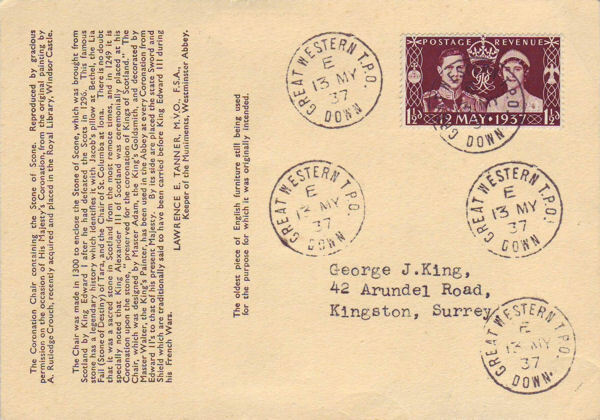 TPO operations resumed after 1945 with the re-instatement of the Up and Down Special TPOs (London - Crewe - Carlisle -Glasgow/Edinburgh - Aberdeen) and the Up and Down Great Western TPOs (London - Bristol - Plymouth - Penzance) on May 6th 1945 (The 106th anniversary in the introduction of the Penny Post!). Gradually other routes were re-introduced between 1946 and 1948 (by which time the railways had been nationalized) taking the number of TPO services up to 46. 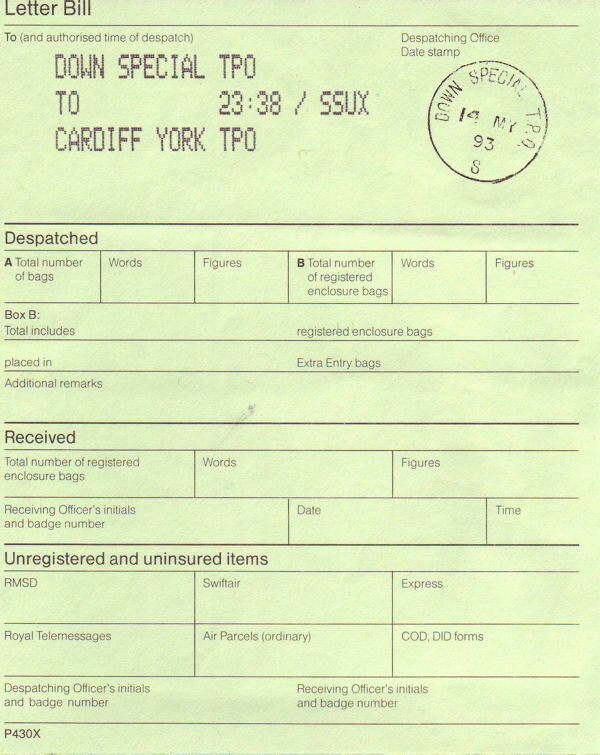 TPOs continued to operate in Great Britain until 2004. Map location of Crewe, Cheshire, United Kingdom.